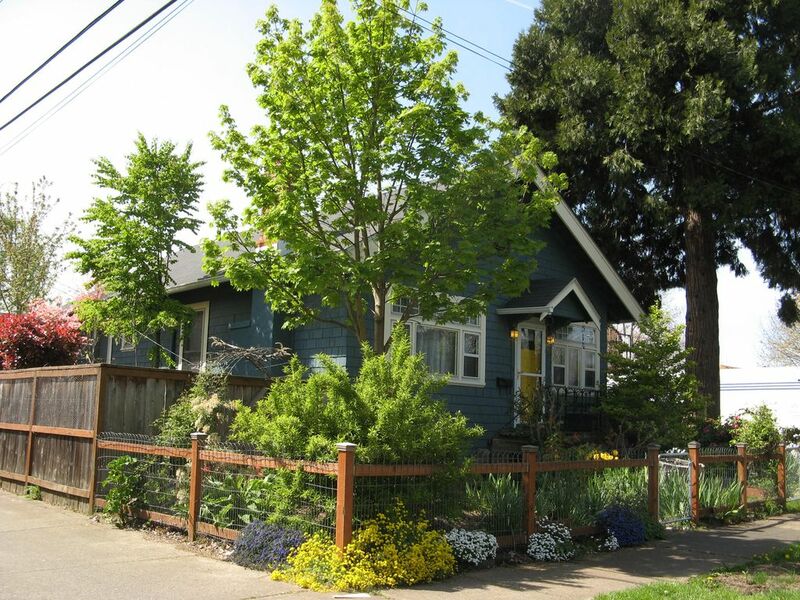 This quaint and charming home is centrally located ,in the heart of downtown Eugene, Oregon. It is only a brisk walk from the eclectic Whitaker / Blair Boulevard neighborhood with its many ethnic restaurants and grocers, gourmet dining establishments and great music venues. One of Eugene's best bakeries is only a few steps away! Deliscious! The Pizza Research Institute and Papa's Soul Food Kitchen are extraordinary and Sam Bond's Garage is a popular music venue for local, and not so local, artists. Just down the way a bit is the Hult Center where touring companies bring theatre and music to Eugene and where the notable Eugene Symphony, the Mozart Players and the Bach Festival perform to the delight of local and international audiences. For a change of pace , take public transportation, or drive,the short distance to Matthew Knight Arena, Autzen Stadium, Hayward Field or PK Park where top notch athletic competitions never fail to thrill and inspire. Beer: Micro brews are another part of the culture and economy of the area that has seen steady growth in popularity. Home brewing is also well supported in the region and worth investigating. Several establishments in Eugene specialize in local brews and offer tastings periodically.. Some of these are within walking distance of this property.. Both bathrooms are fully stocked with a full supply of linens as well as shampoo, soap, etc. For those who have difficulties with stairs, the house has both front and back access via short flights of stairs with handrails for safety. A riser for the commode is also available upon request. Clean, convenient feels like home. Everything was tip-top shape as usual. This was our 4th stay at Madison St & we’ll definitely stay there again. Carolyn is a great host. Our third stay in this charming home. Great location, all the conveniences of home - well stocked kitchen, toiletries, linens - you name it. Carolyn is very professional in booking - and have never had a need to contact her otherwise. We always see if it’s available when we travel to visit son and family while he is artending U of O. Great house with all the amenities you could ever need. Great location. Only issue was sugar ants. Great character to the home. Enjoyed the proximity to lots of good restaurants and events. Really loved how close Sweet Life bakery was! Thanks so much. I would rent again. That title is not the only good thing about this house (though it certainly can't hurt being so close to Sweet Life Bafery!). It's well-cared for and maintained. It's close to downtown and the University, but not too close. It has a fantastic character to it, the decor really captured Eugene: eclectic, fun, and sincere. It's well-stocked and well appointed; I discovered at least 3 new books on the shelves that I will have to find copies of. I would certainly recommend it to travelers. One caveat (and not even worth docking a star over, just something to be aware of): It is street parking only, which can make it a trifle tricky at times. Like I said, absolutely not worth taking a star away, but not a place you can easily have 2 or more cars in sight in front of the house. We love this house. Comfortable, cozy and so convenient. It is our go to every time we go to Eugene. Carolyn's home was perfect for our family of 4. We enjoyed the homey touches in this lovely arts & crafts home. Beds were soft and comfy and kitchen well-stocked for the cooking we did. The downstairs master suite allowed us to retreat early. The living room is cozy and inviting. Carolyn came over Saturday evening when we couldn't figure out how to reset the TV. Also terrific to have a coded door lock. The on street parking was never an issue. Eugene, Oregon finds itself in the enviable position of being located less than two hours from the beauty and drama of the Pacific Ocean and the grandeur of the Cascade Range of the Rocky Mountains. For those interested in outdoor activities this area is unsurpassed. Fly fishing and drift boats, sailing and water skiing are all within a few minutes drive. A trip to the ski slopes is only a day trip away as is a walk on the beach at sunset and all the fresh seafood you can eat. For the competitive athlete Track Town USA is amazing . NCAA, Olympic trials, Eugene Marathon and multiple trail runs, half marathons,etc. consume the spring and summer calendar. There is 100% refund if reservation is cancelled a minimum of 30 days prior to check in. However there is a 10% service charge . Rates are subject to change until reservation is confirmed. Contact owner for weekly and extended stay rates.